I grew up in a house full of girls. So, having boys around is an adventure that I cherish. 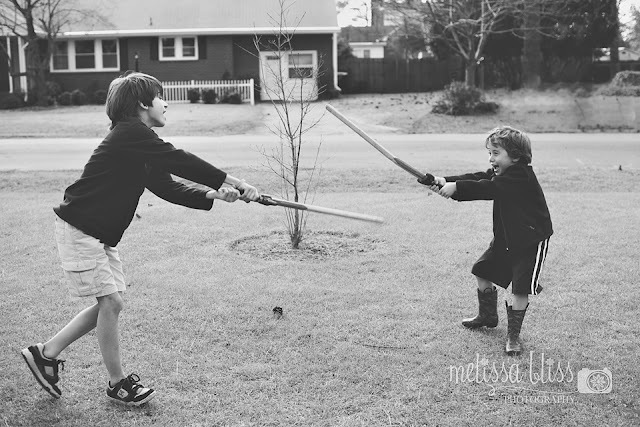 Here's a snap shot of my two little dudes going at it the other day. I love their energy and imagination. And yes, they insist on wearing shorts in January. I have two girls, so this doesn't happen often at my house! (But when it does, they are at least wearing hairbows :)) Great picture! With two girls, we don't have sword fights either! ha ha how fun!! if i can ever get my act together on a Friday, I would love to join you!! Have a great week! What a great moment of brotherly-fun! So overwhelming to see these boys having fun. I see they never grow out of it. Right now my 3 year old is in the ninja phase. Oh my! :O) Never a dull moment that's for sure. I love it and it makes me think of my little brothers!